OS X normally refuses to allow the OpenDNS Updater to run since OS X normally only allows applications signed with a certificate trusted by Apple to run. If the OpenDNS Updater were signed with such a certificate, the OpenDNS Updater would "just work". If you want it to "just work", why didn't you follow the instructions at the link you posted? I know where Gatekeeper options are. The recommended setting from Apple is the selected setting as you demonstrate in the image. However, that setting does not allow the OpenDNS Updater to run, but the less restrictive setting "Anywhere" means that no software verification takes place. This request is specifically that the OpenDNS Updater software be runnable with the default (and reasonably secure) settings, not that I need to disable a security mechanism on OS X to make this work. "However, that setting does not allow the OpenDNS Updater to run"
It does allow to run, but may need confirmation, as shown at the link you posted. "This request is specifically that the OpenDNS Updater software be runnable with the default"
"Note: The default setting for Gatekeeper in OS X Lion v10.7.5 is "Anywhere"." I know how to work around the certificate security mechanisms (aka Gatekeeper) in OS X. This was not a request for documentation on how to bypass that. This was a request to not have to bypass that. Since 10.8, the default has not been to accept any software from anywhere, but only to accept software that can be digitally verified not to have been tampered with. I would like to be able to recommend OpenDNS to other OS X users, but will not be able to recommend that they use the Updater without also recommending that they either disable or bypass a software security mechanism built into their systems. "This was not a request for documentation on how to bypass that. This was a request to not have to bypass that." This "feature" comes from Apple, not from OpenDNS. "Since 10.8, the default has not been to accept any software from anywhere, but only to accept software that can be digitally verified not to have been tampered with." This also comes from Apple, not from OpenDNS. "I would like to be able to recommend OpenDNS to other OS X users, but will not be able to recommend that they use the Updater"
The Updater software is the least part of OpenDNS. OpenDNS is a recursive DNS service, not a DDNS hosting service, so the Updater plays a small role within the service. And the API is very well documented, so it's easy to create a script being able to keep the IP address information updated at OpenDNS, eventually via DNS-O-Matic.. Thank you randallw. Amazed at the responses in this thread... no way am I going to instruct users to choose less secure settings in order to use OpenDNS on their Macs. 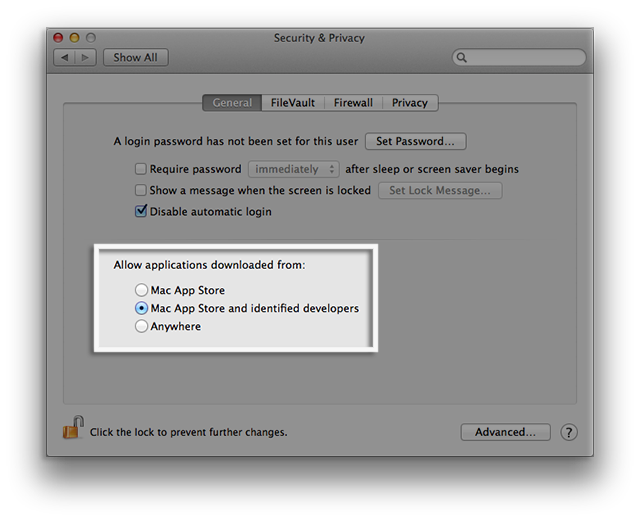 The default settings Apple uses are their for a reason: to increase the security of users' Macs. Which is likely the reason many users sign up for OpenDNS. So please OpenDNS, set up a developer certificate with Apple and sign your software. i'm with randallw and joshuajabbour. i know how to get around the signing restrictions on osx as well but no user of a reputable product should need to. get a developer certificate from apple and sign your code. It's March of 2015 and the updater app still isn't signed. In case you were looking for more support behind this support, here's mine: OpenDNS, please become an identified Apple developer. "manually updating (deleting the old network, adding the new one and re-setting all my custom filters)." No, this is not the way manual updates should be done. How useless is this? You simply visit https://dashboard.opendns.com/settings/ and click the green arrows icon between the former and current IP address. That's all! No other custom settings changes. Alternatively use another update client like the built-in on your router, NAS, DVR, IP camera or whatever device, or another software for a computer. You do not have to use this Mac OSX updater. Any applicable updater would do.